Having recently completed several HR reporting projects in Canberra, we believe there are still a number of agencies that are struggling to deliver timely insights into their workforce. Teams initially try to use the HR system for reporting. While most HR systems have built-in operational reporting capabilities, they struggle with the complex analytical needs of the agency. Productivity reporting needs datasets from other corporate systems to be blended with the HR data. However, it can be difficult to load these datasets into the HR system – particularly if matching rules need to be applied or the datasets are large. Members of the HR/People and Performance team end up manually extracting and blending the required datasets. The results are then stored in Excel instead of a database, which makes comparisons over time difficult and leads to problems with security, distribution and ad-hoc analysis. To improve the workforce analytic capabilities of an agency, we recommend developing an analytics solution that automates the data transformation tasks and provides the foundation for both standardised reporting and exploratory analysis. Automating the distribution of repeatable, secure reporting across multiple levels in the agency. From section-level reports for managers to agency-wide reports for the People and Performance team. The same datasets prepared for internal reporting can be used to meet external reporting requirements. For example regular Workforce Size (ASL) reporting to the Department of Finance, mandatory reporting outcomes to the APSC and gender reporting to WGEA. Team members can focus on generating insights from the data instead spending most of their time preparing it. The rules applied to the datasets are documented and available to users to help build a common understanding of the data across the agency. The solution can be extended to provide insights beyond standard reporting. Once the hard work of producing trusted datasets has been completed, analytical and machine learning capabilities can be utilised – an example of this is staff retention modelling. Blending datasets from multiple systems to produce agency-wide operational, KPI & analytic reporting, including mandatory reporting to the APSC and Department of Finance. 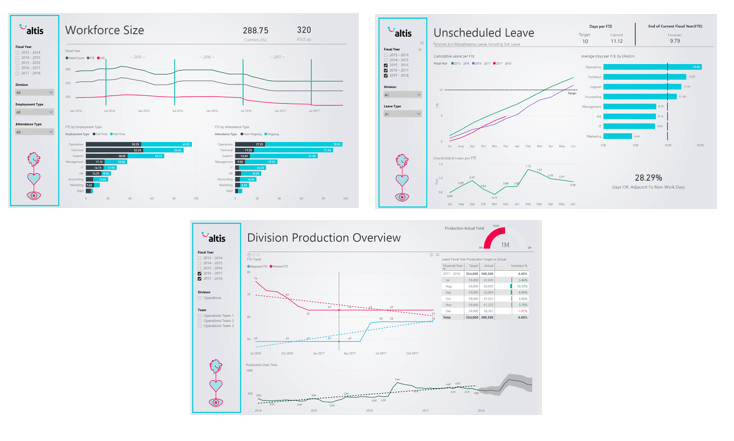 Performance metrics for individual staff through to team level aggregates, blending data from operational systems to provide managers with key production and productivity insights. Gender Pay Gap analysis across classifications, job roles and divisions. Using Machine Learning techniques to make Workforce Size predictions. Time Sheet reporting that includes invoicing and anomaly detection systems that enable managers to monitor staff wellbeing as well as allowing Finance to pay timely and accurate invoices. We have compiled a suite of reports that can be used to kick-start your workforce analytics implementation. These have been built using Power BI, but as a technology-agnostic company, our solution will work with whatever your technology stack is in place at your agency. We would love to speak with you about how we can enable you to improve your workforce insights, so get in touch if you would like to see a demo, or stop by our booth at the upcoming Australian Government Data Summit. Stay tuned for upcoming blogs that demonstrate some of the newer technology components that are available to enhance workforce analytics, such as applying sentiment analysis to survey and social media datasets, and methods for measuring staff engagement.